Welcome dear Bookworms..another wow day and we have with us Yaseen Anwer, a poet who breathes poetry and lives to write poetry. Yaseen Anwer is the Founder and Managing Editor of poetry group “Poets Corner Group”. He is widely published poet and has contributed for more than 70 national and international anthologies. Coming up with the innovative idea of publishing young aspiring poets with eminent personalities, this brainchild of his, has over 4000 members across the world and over 11 printed anthologies where the works of several amateurs have been published. Yaseen writes in Hindi and English and the group promotes poetry in both languages. He also has had the honor of having his words translated to other languages like Chinese, Portuguese, Hindi, etc. 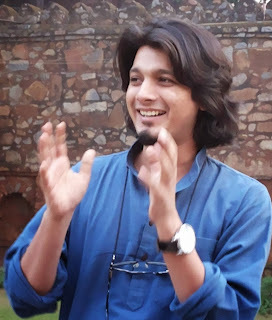 Born in Patna in a middle class household with his father working as a doctor and mother as a homemaker, He believes poetry is the best expression of emotions and started reading and writing poetry at the age of fourteen getting inspired by poets such as Rabindranath Tagore and Mirza Ghalib. Encouraging newer talents in poetry and publishing them alongside renowned poet-personalities like Dr.A.P.J Abdul Kalam, Ruskin Bond, Vikram Seth, Gulzar, Irshad Kamil, Kapil Sibal, Shashi Tharoor, Deepti Naval, Shekhr Kapur etc. he has enabled the dreams of many like him to be fulfilled and have made them feel to be a part of the bigger picture. Recognizing his talent and effort in the field of poetry, he was awarded with the “Young Poet Award 2012” by Indian poetry society. Mating my house with feral fire, she walked away...!! !